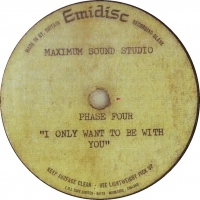 Tracks 1 and 2 recorded at Maximum Sound Studios on Emidisc acetate. Track 3 is a Oak Demodisc acetate. This group is un-related to the Phase 4 from Newcastle-upon-Tyne (Decca and Fab recording artistes) featuring Norman Nossiter and Allan Minnikin. Also un-related to the Phase Four from Southampton featuring Mike Batt (future Wombles producer). Thanks to Denise Sargeant, Mike Batt and Norman Nossiter for their invaluable input. Very special thanks to the Purple Heart Archive. 2011.